Check out TVNow.com to see if Meg's movies are playing! 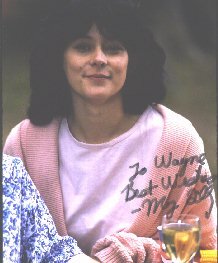 The Official Meg Tilly Web Site! Click here to Sign (or just read) the Guest Book! It finally happened! "The Day I Met Meg Tilly"
Meg's third and latest book, "Porcupine"
Meg's first novel "Singing Songs"
Please read this page "The Web Site History Page"
Do you look like Meg? "Meg Look-Alike Page"
What's Your Favorite Meg Movie? 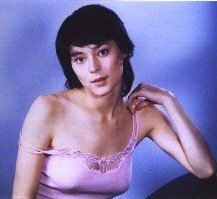 "Online Meg Tilly Poll Page"
Meg's Picture Galleries "Gallery Page"
Hi, and welcome to my Meg Tilly "Homage" Page. If you are new, then I hope you will like what you find. If you've been here before, you'll notice I've made a few changes! The "Sound Bytes" are now available on the respective movie page. Also, you can now jump directly to the movie page from links in the "Movie Works" section below. This keeps you from having to go to a menu and then to the page you want. The biggest changes are pages about Meg's three novels, but I've also got VIDEO CLIPS and more pictures! The video clips are actually 'trailers' from Meg's movies provided by Bigstar.com. I've added links to them under the respective movie link down below. I have to give a big Thank You to Rhiannon O'Connor for pointing me to the video clips as well as helping me find a reference for an Apex award that Meg won. And, for my own collection as well as for all her fans, I have been scouring every resource I can find for more pictures. I'll be adding them here as soon as I can get them scanned. Look for the links! If you're here, you probably are like me and have found that there just isn't that much out there on her. Admittedly, this site isn't much and I don't believe in fancy "bells and whistles", but thought I'd share what I have. Also, while I've researched this info as best I can, I'm always willing to admit a mistake - so, if you find an error, please email me and I'll correct it! Raised in British Columbia by her mother and step-father, Meg started taking dancing lessons at age 12. She earned a scholarship to a top ballet school in New York, but a serious back injury ended her dancing career. She then went to Los Angeles to pursue an acting career and the rest, as they say, is history. Below is a list of her film and TV work. Click on the title to go to the full page with pictures and where available, sound and video clips. Primal Secrets - 1994 (Faith Crowell) also known as "Trick of the Eye"
Hill Street Blues - 1981 "Some Like It Hotwired"
Meg tends to shy away from publicity, and if you have caught any of her interviews, you'll know she's definitely not your typical "star". At least for a while, Meg divided her time between southern California and her home in Canada, and she didn't even have a television! But, I think it is pretty admirable that she prefers to spend time with her family as opposed to living in the limelight. Just another reason I admire this woman. Meg now lives in the vicinity of Vancouver, BC, Canada and works on her writing career. One bit of trivia that has been asked a LOT concerns Meg's 'ethnicity'. Well, for the longest time this was a topic she and her sister Jennifer seemed to avoid, but a few months back, Jennifer announced to the world that their father is Chinese. So, that should answer all of THOSE questions. Meg was born Margaret Chan, a fact that has been all over the Internet. Personally it has never made much difference to me - she is who and what she is! Oh..! And for all of you who have been asking how TALL she is - an article about Meg in the January 1984 issue of 'Seventeen' magazine states she is 5 ft 6 inches. If you'll check out the pictures of her with me (I'm 6' 1") in "The Day I Met Meg Tilly", you'll see this is a pretty good estimate. Although Meg hasn't made any movies since about 1995, she has been busy! She has three children - two by 1st husband Tim Zinneman, whom she divorced in 1989 and a third by actor Colin Firth. In addition to a busy personal life, she has written three novels to date and is working on a fourth ("Lucky"). The first was titled "Singing Songs" (which I thought was pretty good!) followed by "Gemma" - which was released in October 2006. Both of these novels centered around brutal child abuse and upon the release of "Gemma", Meg admitted that these stories were based upon actual incidents and people from her own childhood - an admission that caused her a lot of personal grief but took unimaginable courage. I think admitting something as horrible as this not only strenghtens the power of her stories, but hopefully will educate and inform the public of this terrible fact of life. I'm posting a page about "Porcupine", but right now my information is very scant. I just received my copy yesterday so haven't had a chance to read it, but rest assured I will add my own comments and review once I've finished. I do have pages for "Singing Songs" here where you can learn a little more about her novel, and read a short chapter and a page for "Gemma" here but I am still working on adding updated information. For those of you who have heard the rumors, "Singing Songs" was optioned to make into a movie, but apparently that isn't going to happen. Updates! Meg has married for the third time (3rd time's a charm!) and is now living a private life somewhere in Canada. She is doing a smaller promotional tour for "Porcupine" than she did for her previous two novels, but she is still getting out there. This is exciting news for all her fans, and you can read a little more about it here. I will post any tour schedule information I can find on this page as well. This is one of my prized possessions, and it took a long time to get it! I do not have any sort of mailing or contact address for her, so please don't write and ask. If you have a legitimate and serious reason for contacting her other than "fan mail", you can find a link to her literary publicity manager on her official site. 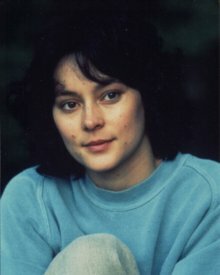 If you have ANY info concerning Meg Tilly or have any questions I might be able to answer, I'd be very interested in hearing from you. You can write me at: waynew@xmission.com or... post it in the Guest Book. I had to remove my Guest Book for a period because of some unscrupulous types using guestbook entries to advertise their products. I am now using a different Guest Book and hope it works out for all of us. Please give it a try, and report any problems to me.